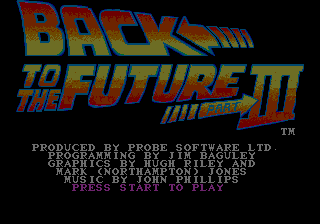 Back to the Future Part III, often simply known as Back to the Future III, is a video game released for the Sega Mega Drive and Sega Master System. It is based on the 1990 film with the same name. Back to the Future Part III starts with a notoriously hard level, in which players, controlling Doc Brown riding a horse, need to catch up with love interest Clara Clayton before she falls into a ravine. / fires a gun in the direction of the D-Pad (unless pointing downwards, where Doc can pick up fallen objects for extra points), while / makes the horse jump. While the game offers no limit on how many times the level can be attempted, if Doc is hit and subsequently falls off the horse three times, he will begin again from the start. The speed of play, combined with artistic choices and the constant barrage of threats makes this stage far more challenging than later levels. Obstacles (which are not always easy to distinguish from the background) quickly emerge from the right (save for bandits which chase Doc from the left and fire at him) and require quick reflexes to avoid (to the point where it becomes more of a memory test). Much of the game's negative press comes from this level alone. This segment is missing from the Master System version of the game. Game received poorly due to short length and brutal difficulty level, particularly that of its first stage. An error in the Mega Drive version's palette storage results in the game appearing darker than it actually should be. On the Mega Drive, the bit order of palette colors is 0000BBB0GGG0RRR0, with RRR, GGG, and BBB being the red/green/blue components of the color and 0 being zero bits. This game, however, uses 00000BBB0GGG0RRR by mistake; the lowest bits of the components are ignored by the hardware, resulting in a color range (000, 001, 010, 011). Because smaller values are darker, the colors will thus appear darker. Produced by: Probe Software Ltd.
Design by: Probe Software Ltd.
Main article: Back to the Future Part III/Magazine articles.